It’s a showdown for the ages. The two heavyweights of the international shipping industry facing off. In one corner: Air Freight. In the other corner: Ocean Freight. This is like Ali vs. Frazier, Mayweather vs. Pacquiao, Tyson vs. Holyfield… but without the violence and risk of getting an ear bitten off. Unless, maybe, there’s an attack by pirates, which still happens sometimes in the world of international shipping. This fight will give between the two major types of international shipping will help answer the shipper’s common question: Do I ship by air or do I ship by sea? A fighter needs speed to get those jabs in or dodge a right hook. As an international shipper, you may need speed in delivering your cargo on the other side of the world. When it comes to the speed department, air freight has a clear advantage. International shipping by air often takes only days, while the time it takes to ship by certam ocean is measured in weeks, and can occasionally even take a couple months. Ocean freight is also slowed down by slow steaming to conserve fuel and reduce CO2 emissions, and ships stopping at several ports along trade routes to load and unload cargo. If you have a need for speed, like Tom Cruise, take to the air. Round 1: Speed goes to air freight. When it comes to a fight, you want someone in your corner you can count on. Often, more experience means more reliability, but not in the fight between air freight team and ocean shipping. Air freight shipping has a much, much shorter history than ocean freight shipping, yet air freight tends to win the battle of reliability. Often, a day or two here or there doesn’t hurt; however, for many businesses, a day or two could have serious cost effects. With airlines, there are usually daily flights back and forth between major cities around the world. Because of this, missing a flight doesn’t cause much of a delay for a cargo shipment. Flights can get delayed by weather and other factors, but airlines tend to be on top of their schedules. Ocean carriers, on the other hand, are notorious for being bad about this. It is not uncommon for ships to be off schedule. Reliability from carriers was supposed to get better with carrier alliances, but really, all we’ve seen is more congestion at ports since the onset of the alliances. Unlike daily flights with the airlines, ocean lines tend to have weekly schedules. Sometimes, every other week! Therefore, missing the cutoff at a seaport means a much longer delay go to these guys. Add factors like port congestion, labor union slowdowns and strikes, ocean storms, as well as those pirate attacks in certain trade lanes, and reliability for ocean freight takes another hit. The odds of goods being damaged or lost also increases on the ocean and with each port a ship calls upon along its route. Round 2: Reliability goes to air freight. Ask any fighter, any athlete, and he or she will tell you that being the best doesn’t come without cost. Therefore, it’s no surprise that you’re going to pay more for the leader in speed and reliability. Generally speaking that is true. Air freight can often be 5 times as expensive or even more than ocean freight. While typically it is true that shipping by air is more expensive than shipping by sea, this is not necessarily always the case. Airlines bill you by what is called a chargeable weight. Chargeable weight is calculated from a combination of the weight and size of a shipment. Sea carriers charge per container rates for shipping in ipsum standard cestovného containers (20’ and 40’ being the most common sizes). While weight can factor into the price from sea carriers, their charge tends to be based more on the size of a shipment. If you are shipping less than a container load, your price is often determined by cubic meter. With larger and heavier shipments, it is often much cheaper to ship by sea. As a shipment gets smaller, the margin between the prices gets smaller and on a few occasions, air will even end up less expensive. Shippers should note that there are destination charges to consider. Whether shipping wholesale mlb jerseys by air or by sea, there will be customs and destination fees. While the actual shipment cost of sea freight is usually cheaper than the shipment cost of air freight, the warehousing fees at seaports are many times more expensive than those wholesale nfl jerseys at airports. 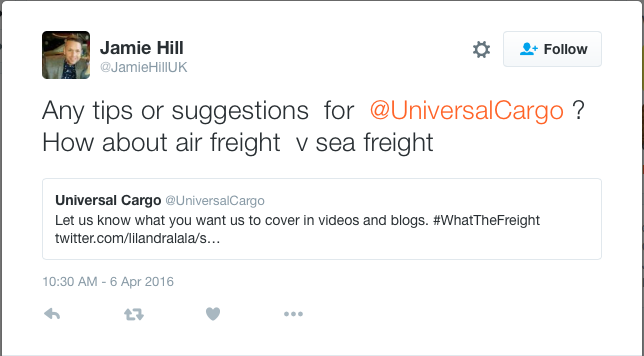 Even with the couple jabs air freight got in there, Round 3: Costs goes to ocean freight. This is like that giant fighter who steps in the ring with a smaller, faster fighter. It doesn’t matter how fast the smaller guy is, the bigger fighter absorbs all his jabs, waiting for the smaller fighter to get tired, and then knocks him out with one blow. It’s no contest in this category. Especially now, with the onset of megaships, there is just more cargo space on ships than in airplanes. This is why ocean shipping still dominates cargo movement around the world and typically costs so much less than air freight. Ocean freight struggles with overcapacity, that is, more space than there is cargo to demand it. This really pushes down freight rate pricing down. Space on planes is limited, pushing up prices for that space. Of course, the bigger the cargo you’re trying to ship, the harder and more expensive it becomes to try to ship by air. Round 4: Capacity goes to ocean freight. A fighter always seems to have an advantage on his home turf. The farther inland you go, the farther away you are from ocean shipping’s home turf. Air freight tends to give you flight options from just about any major city to any other major city in the world. This means less time and money spent on trucking if your destination is far from ocean ports. There are other options to move cargo from ports to inland destinations, including rail and short sea shipping networks that use inlets like rivers for cargo transportation. With these options, ocean freight can be used to ship just about anywhere in the world, but time can significantly increase in some locations. With air freight’s tendency to be more direct, with cargo ships traveling to multiple ports on a trip as discussed above, air freight edges out ocean freight in this round. Round 5: Destinations goes to air freight. You always want to see everything that is happening in a fight. That doesn’t change when it comes to your cargo. Universal Cargo always gives its customers tracking with iView Desktop on cargo shipments, whether air freight or ocean freight. Both options are trackable cheap jerseys so the shipper knows what is happening with his or her cargo. Round 6: Tracking is a tie. A good fighter has a strategy when facing an opponent. You don’t want to handle international without strategy. The question is, will one form of shipping be more complicated than the other. No matter what form of international shipping you use, there is paperwork, regulations, fees, customs clearance… And different locations bring different rules, regulations, and fees with them. Either sort of shipping is complicated on its own, but with a good freight forwarder, especially one with in-house brokers for customs clearance, the complications are handled for you and you’re walked through the process, be it for air freight or ocean freight. Round 7: Logistical Complications is a tie. Good footwork is important in a boxing match. And in the world we live in, our ecological footprint is very important. How your company affects the environment is an area where we leave convenience and the bottom line behind. While the social awareness of environmental issues can change the way the public looks at a company and affect its bottom line, we all have a responsibility of taking care of the planet on which we live. Oil spills from shipwrecks and the water ecosystems that can be affected by cheap nfl jerseys ocean freight gives one pause, but these things are not nearly as common as CO2 emissions. CO2 emissions are much, much higher in air freight transport than in ocean freight transport. This causes cargo shipping by air to have a much larger carbon footprint than cargo shipping by sea. In fact, the International Chamber of Shipping created the following graph that visually shows how large the gap is between CO2 emissions on ocean shipping vurses CO2 emissions on air freight. Round 8: Environmental Impact goes to ocean freight. Which is the champion, air freight or ocean freight? You tell us! It probably depends on if we’re talking heavyweight or featherweight, right? 3 rounds–speed, reliability, and destinations went to air freight, 3 rounds–cost, capacity, and environmental impact went to ocean freight, and 2 rounds–tracking and logistical complications–are a tie. You’ll have to decide which factors are the most important for you and wholesale mlb jerseys your business to declare a winner. Of course, whether ocean or air shipping is right for you could very easily change from shipment to shipment. Aayan International Cargo - Kuwait was established by an industry veteran, carrying over 28 years of freight and logistics management experience, aiming to cater the transport solutions for small and medium-sized companies with utmost care and attention. As a member of World Logistics Network, Aayan International Cargo is globally connected with the best forwarders to provide an excellent worldwide transportation solutions. Aayan International Cargo believes on flexibility, reliability and transparency.